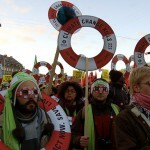 COP17: Inspiring the global climate justice movement - Climate Justice Now!Climate Justice Now! PAMBAZUKA NEWS: What role will Environmental Rights Action (ERA) and Friends of the Earth International be playing at the UN Climate Change Conference (COP17) in Durban? What will you be pushing for? NNIMMO BASSEY: While there is a generally low level of expectation from the Durban Conference of the Parties (COP17), we see it as a great moment to stand with impacted peoples and the environmental justice movement and call for a climate tackling regime that understands the depth of the crises and the fact that the impacts are already manifesting. We will push for polluting countries to cut emissions at source and not through offsets and related market mechanisms that help polluters profit from the damage they do. We will push for legally binding emissions reduction targets to ensure that temperature increase is kept below 1.5 degrees Celsius above preindustrial levels. ERA will demand the recognition and payment of the accumulated climate debt due to centuries of exploitation and colonisation of the atmosphere. Friends of the Earth International will particularly bring to light the negative impacts of carbon markets, dirty energy, dams, agrofuels, plantations/industrial agriculture – all funded or potentially fundable through the carbon markets. We will also highlight land grabs and related issues. Details of our full focus are still being fine-tuned. As you know, we have member groups in 76 countries and each of these is autonomous so we invest time and energy in consultations. You will hear of our detailed plans once they are ready. PAMBAZUKA NEWS: Judging from the outcome of the COP 16 in Cancun, Mexico, obtaining a multi-lateral agreement through which those most to blame for causing climate change take responsibility for the damage they are causing to those most affected by climate change, is unlikely to happen at COP17 in Durban, South Africa. But even though this is expected to be the case, why is the Durban event still important for climate justice activists? NNIMMO BASSEY: You are right to say that we may not expect an equitable outcome from Durban. Nevertheless, Durban will be a great moment to intensify campaigns against the business-as-usual manner [in which] the negotiations have been conducted. Durban has a rich history that will inspire the climate justice movement to get stronger. Remember that Gandhi’s non-violent resistance was more or less birthed in Durban. Some of the most intense organising against apartheid also occurred in Durban. Currently, Durban is the hub of the environmental justice activism in South Africa. This has not occurred accidentally. Durban has some of the most polluted neighbourhoods in the country, with highly polluting refineries and chemical factories located there. The building rage on the streets of Durban will inspire the Climate Justice movement. For me, the need to resist the planned offshore exploration for crude oil off the coast of Durban, an act that is bound to rub salt in raw injuries, holds an additional pull. PAMBAZUKA NEWS: Hypothetically speaking, what in your mind would be the key aspects of a just global climate deal and why? NNIMMO BASSEY: Getting polluters to accept to cut emissions at source and to the extent required by science to keep global temperatures below 1.5 degrees Celsius. A regime of voluntary targets would simply translate to roasting Africa and sinking the small island states. PAMBAZUKA NEWS: At other COP events, activists have rallied against market-based solutions such as the Clean Development Mechanism (CDM). What kind of ‘false solutions’ should we be watching out for in Durban and why? NNIMMO BASSEY: Durban will likely build on the same discredited CDM. We should expect to see more vicious forms of REDD (Reducing Emissions from Deforestation and Forest Degradation in Developing Countries) that will intensify the land grabs already troubling Africa, Asia and Latin America. In deed, we should expect the addition of soil carbon capture into the matrix. This will aid speculators to begin a pattern of soil grab that will push small-scale farmers into more or less barren lands, thus ensuring an increase of hunger and malnutrition in vulnerable communities. PAMBAZUKA NEWS: The north will be pushing for the ‘green economy’: How far is this ‘green’ the colour of dollar bills, and what should be the components of a real green economy? NNIMMO BASSEY: This is a rather funny but serious question. The green economy concept being pushed through the Rio+20 (Unite Nations Conference on Sustainable Development) discussions and the climate negotiations is template for green washing. It will help brown sectors such as the petroleum and chemical sectors to claim they are green through embarking on token projects. The ‘green economy’ is a worrisome concept that needs careful interrogation, otherwise what we will have is the ignoring of the intrinsic value of nature and the formulation of fictional exchange values on natural systems for profit and to the detriment of the people. PAMBAZUKA NEWS: Can you give any recent examples where you have seen the on-the-ground impact of climate change for Africa? You recently wrote about flooding in Nigeria. What other evidence is emerging and what has been the impact. NNIMMO BASSEY: The droughts and famine in the Horn of Africa is a very clear example. The tragic consequences are all avoidable if the countries involved had developed and built resilience and coping mechanisms. Rain failure occurred over a period of three years, but the governments and institutions kept blind eyes to that. Analysts saw that due to the warming of the Indian Ocean, rain that ought to fall on the land is now mostly falling on the ocean. This is a clear signal of more disasters to come. Crop loss and poor harvests are clear evidence already noticed in some areas. Desertification is impacting at least 13 states in Northern Nigeria and this is expanding. Coastal erosion due to sea level rise is a reality. 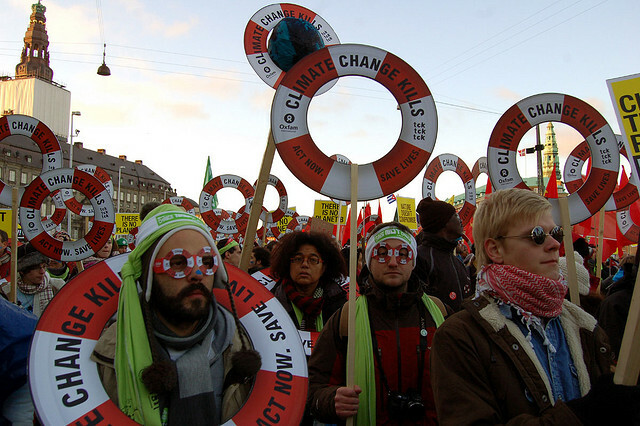 PAMBAZUKA NEWS: The idea of climate debt – that developed countries who have caused the damage to the environment owe developing countries – has been promoted by Bolivia and progressive civil society movements. But at the same time the UK, through the World Bank, is lending money to developing countries for adaptation, locking these countries further into debt. What’s your view of this? NNIMMO BASSEY: Countries have made the issue of funding adaptation a major point of the climate negotiations, with proposals and designs for climate funding taking huge and unending chunks of time. Climate debt has been a campaign point for environmental and social justice activists for some time now. The promotion of the idea by countries such as Bolivia indicates a possibility of building more points of agreement between states and citizens. Climate debt was also captured as a major demand at the World People’s Conference on Climate Change and the Rights of Mother Earth, held in Cochabamba, Bolivia, April 2010. If climate debt is accepted and paid, it will right many historical wrongs, provide funds for adaptation and for building of resilience in vulnerable territories and nations/regions. It would also help exploiters and polluters to seek just ways of doing business and of relating to others. It would require a rethinking of our global accounting books. It would show that the so-called poor countries have credited and subsidised the rich nations and that the ‘rich’ nations are actually the debtor nations. The question of lending money to developing countries for adaptation would not arise as the payment of the debt would suffice and probably leave a surplus. In fact the whole idea of adaptation without halting the causative factors driving the problem to which nations must adapt is unacceptable. The position seems to be that we cannot do anything about climate change and that all we can do is to adapt to it. The fundamental driver of the argument is business as usual. This has made some see climate change not as a crisis but as a business opportunity. PAMBAZUKA NEWS: Bolivia has published a declaration on the rights of Mother Earth and even established a ministry responsible for protection of those rights. What is the likelihood of similar declarations in Africa, and what will it take to make that work? NNIMMO BASSEY: First of all we must applaud Bolivia for taking these steps. To a lot of people the right of Mother Earth is something idealistic and impractical. Even the concept raises barriers that many cannot cross because of the preponderance of adversarial legal systems in the world. When they hear of the rights of nature or the rights of Mother Earth, they wonder how can Mother Earth demand the protection of her rights. If we see ourselves as being children of the Earth, of belonging to her and not owning her, that argument should not arise. Children can speak for their mother. Will African nations make similar declarations? My answer to that is a yes. They may be slow to come around, but the recognition of the rights of Mother Earth provides one of the best platforms for the defence of the African environment. It would provide the basis for citizens to fight against destructive actions in their countries. At present even environmental rights are merely national objectives in some national constitutions and are not justiciable. This is the case with Nigeria, for example. The best option for seeking justice has been through the use of the African Charter of Human and Peoples Rights ratified and domesticated by many African countries. Bolivia is equally promoting the Universal Declaration of the Rights of Mother Earth by the United Nations. If and when this gets to be adopted, African nations will eventually come around to consider and accept this platform. This is an opportunity for socio-political, environmental and other movements on the continent to campaign for the adoption of this important and fundamental right. PAMBAZUKA NEWS: Previous climate meetings such as Copenhagen in 2009 and Cancún in 2010 have faced strong criticism for the tendency to silence the voices of Southern countries and civil society organisations. Do you feel that this situation will have improved for Durban, or will it be ‘business as usual’? NNIMMO BASSEY: The South African government has dubbed COP17 ‘the people’s COP’. We wait to see what will happen. I expect that these voices will be very loud in Durban. Will they be heard? That is another question. In Copenhagen we were muffled. In Cancun we were spatially dispersed. In Durban there may be another structural barrier that the clever neoliberal system is always capable of erecting. We will be pleasantly surprised if the dominant voices will allow others voices to be raised and heard. PAMBAZUKA NEWS: While much of the global South faces the same challenges in relation to climate change, it is often difficult to achieve political unity and speak with one voice. Do you see strong political unions developing between countries around the issue, or are countries likely to push their own positions? NNIMMO BASSEY: Strong political unions will eventually emerge, but not in Durban. There will still be nations out there with broken drums to ensure that discordant tunes emerge. The game of these truce breakers is that they thrive on crumbs that fall from the tables of powerful countries. It is unfortunate that in place of principled stands for justice and equity, Southern leaders prefer to kowtow to powerful nations, extend empty bowls for crumbs and wear ‘vulnerability’ as a badge of honour. Countries will be glad to be invited into the so-called green rooms and made offers of aid or some other assistance. Having said that, it must be agreed that efforts have been made by civil society to show the existing negotiating blocks the convergence of their needs and why they should stand together for the sake of the planet. Unfortunately, nations appear to gravitate towards narrow interests that do not even reflect the desires of the mass of their citizens. It appears that strong, united voices will emerge when leaders learn to listen to and hear the led. PAMBAZUKA NEWS: How would you describe the general level of understanding of climate change within government departments tasked with representing their citizens at the COP17? NNIMMO BASSEY: Unfortunately the level of understanding of climate change within government departments is not based on rigorous interrogation and understanding of the issues. Even where there are excellent technocrats and negotiators within governments, a firewall seems to exist between these and the policymakers. This dissonance erases what may have been gained from the use of available knowledge in such departments. This arises sometimes because the technocrats build knowledge over time. They also build relationship with knowledgeable civil society actors who enrich their resource base over time. The policymakers and ministers on the other hand have less experience on the job, are changed frequently and may represent narrow interests that do not coincide with those of the citizens. This will play out once more at COP17, unfortunately. PAMBAZUKA NEWS: In your view, how successful have African civil society and governments been at communicating the challenges around climate change to wider society across the continent? NNIMMO BASSEY: Civil society groups through campaigns, mobilisations and community meetings have made good efforts in communicating climate challenges. I am aware of efforts being made with youths and children as well as with women groups. Much more needs to be done by government. People are still being taken by surprise by climate change impacts. The people are not being prepared for the huge challenges rolling down their way. Much more work remains to be done at all levels. PAMBAZUKA NEWS: What role will the African Union have in the meeting? NNIMMO BASSEY: The African Union ought to have a pivotal role in working for the attainment of the aspirations of the peoples of Africa during the meeting. Africa is the least ready to cope with the impacts of climate-induced catastrophes. Yet it is not clear that the AU will be helpful at the meeting. Information that has emerged from sources such as WikiLeaks have shown how compromised some leaders in the AU climate change efforts are. There is no reason for us to be hopeful that the AU will push a strong and principled position that would help the continent. We can look forward to hear pleas for charity rather than clear demands for climate debt to be paid and for the rich nations to stop fuelling conflicts on the continent that further reduce our capacity to stand the climate challenges. PAMBAZUKA NEWS: While media and mainstream discussions around energy consumption in relation to climate change tend to focus on individual use, it is often the activity of corporations which commands a considerable slice of national energy use. What scope will the COP have for debating corporate consumption of energy? NNIMMO BASSEY: That discussion will be on the outside, in the civil society spaces. These are the spaces where actions for the future will be construction. That is where the fundamental causes of climate change will be dissected and real solutions like pushing for a post fossil civilisation will be made. On the inside of the COP the emphasis will remain on how to give corporations the best conditions for investment. It will be the space for the cheaper access to electricity for corporations. They will seek for and possibly receive the basis for more fossil fuels and related devious subsidies to be guaranteed the corporations through having their ally, the World Bank, playing central roles in climate finance architecture. It will be a platform for the formulation of more carbon offsetting and trading mechanisms to allow corporations intensify their polluting binge while piling up their profits from the ecological and human misery they leave in their wake. Recently the UN began the process of engaging the eight biggest electricity companies in the world to advice on how to expand access through the Private-Public Partnerships that the UN sees as the solution to the energy poverty in the world. The space will provide the right ‘financial risk-reward atmosphere’ for the companies and help consolidate the position of existing power companies and more to come! PAMBAZUKA NEWS: Much like the threats posed by GMOs (genetically modified organisms) in relation to the global food system, activists are increasingly wary of the corporate backing given to drastic technological solutions such as geoengineering of the sky. Will there be discussion of these risky technologies at the COP? NNIMMO BASSEY: There will likely be discussions of the risky technologies at the COP especially where they move into discussions on new sorts of REDD. They may not mention geo-engineering by name, but generic discussions will pave the way for carbon credits to be earned through soil carbon storage, for instance. In fact, there are attempts to push genetically engineered crops into the environment in Africa in the guise of supplying climate ready crops that can withstand severe weather events. The false claims of the modern biotechnology continue unabated, driven by huge corporate interests and their shoe-shining governments. There will be frank and intense debates about these risky technologies at the COP, but, again, these will be mostly on the outside. A big challenge for this and future meeting is on how to build a convergence between the inside and the outside. Indeed, how to make the outside the inside, so that government can be of the people, by the people and for the people. This entry was posted in Adaptation, Climate Debt, Finance, Negociations, REDD, Toward Durban and tagged Africa, cancun, carbon market, CDM, Climate Debt, Cochabamba, emissions, Energy, Environmental Rights Action, Friends of the Earth International, green economy, offsets by admin. Bookmark the permalink.